[2017 Update] Picked up a pint this fall to grab new pictures. I enjoyed it and all, it's just never been my thing really. Original review is after the jump. 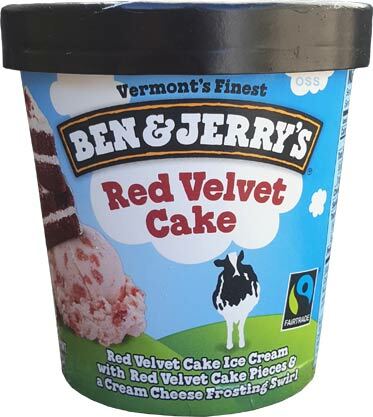 [New for 2011] I'm not sure if I've ever had red velvet cake, and if I did, it was once, but I am about to go ahead and try red velvet cake ice cream from Ben & Jerry's. Wish me luck. Hmmm, well this looks promising. 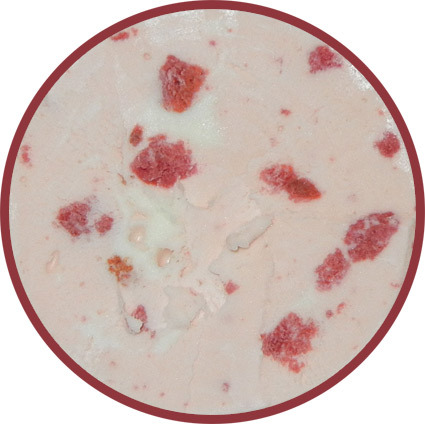 It looks like strawberry ice cream with frosting and strawberry cake bits. Ok, you never really see strawberry cake, but... well, now I want strawberry cake and it doesn't exist! Sorry, hungry. Nothing like a ton of cake bits to get the mojo started. I dig in and I taste... well, I taste a fairly sweet cake batter and I definitely taste the cream cheese way more than I expected too. 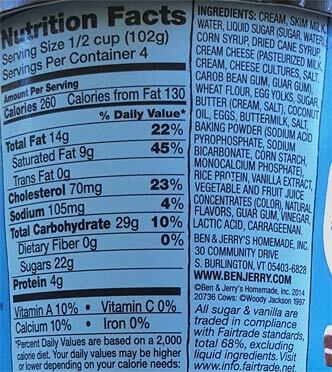 We've got our typical ben & jerry's quality and texture, but the cake batter and cream cheese seem to be battling it out for top flavor with every scoop. Yeah, I'm not real sure how I feel about this because I'm not a huge fan of either flavor. I like the grit that the cake pieces add, but I'm not sure I can tell the difference between their sweetness and that of the ice cream and swirl. Granted it's usually hard to tell the difference between any ice cream and cake mix-in, so this isn't a surprise. On my first good size sampling, the cream cheese flavor really got stuck on my taste buds and I couldn't shake it, even when I was done. For my second scoop, I just had a small sample with more of a back and forth between the two flavors, but I'm still not really enjoying it. I decided to call it quits and let my wife finish the pint. I knew she would enjoy way more than I would. Look, I'm not going to lie and say I like cake batter flavor. Only in the most perfect of circumstances am I even remotely amused by it. Sure, I licked my fair share of mixing spoons as a kid, but I find cake batter ice cream too sweet and too strong. That said, B&J did a pretty good job of trying to keep the c.b. flavor in check. I also would have preferred a bit less cream cheese swirl. Finally, take the overall sweetness and robustness down a notch or two and I might consider a second pint. This one's for you cake batter lovers, enjoy! 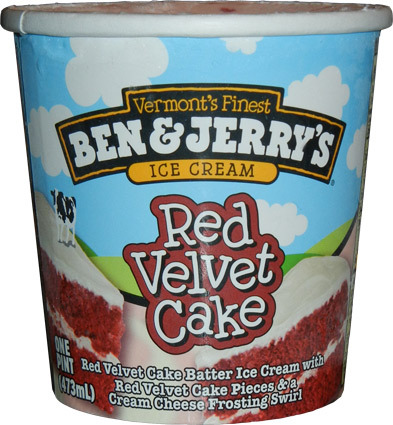 as great as ben and jerry's is, real red velvet cupcakes > b&j's red velvet cake. but i'd still punch any old ladies that are in my way to get to a pint of this. They do have strawberry cake. When I was in grade school it came with cool whip on top probably to emulate strawverry shortcake but no this cake was actually strawberry flavored. I just found all the new flavors at my Super Target the other day. Can't wait to try them. BTW, Target has two new Target only flavors, Volun-Tiramisu and Peanut Butter World! @courtney thanks for the tip, I just looked it up and will get myself to target immediately! This ice cream is SOOO good! It's my new favorite. That being said, I LOVE red velvet cake, and I LOVE cream cheese frosting. But, not that many people do. If you're not a huge cake fan, or a huge cream cheese fan, I can def see how it could be over powering. This is def one to try if you do enjoy cake and cream cheese tho. I enjoyed it. This is simply fabulous! And it does taste like (good) red velvet cake, which I've had exactly once (at a wedding) and still remember. The ice cream's flavor is deep and mellow. The cake pieces are a very nice contrast to the batter and frosting elements. HOORAY for this wonderful ice cream! As a red velvet lover, this ice cream disappointed me. Too generically sweet and not enough of the red velvet flavor (which is actually cocoa- of which this ice cream contains exactly ZERO). Lovers of red velvet, don't bother! 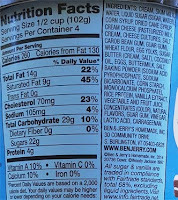 I do enjoy a good Red Velvet cake so I was really excited to see this Ben & Jerry's flavor. I also adore Cake Batter ice cream. Let me say I was sooooo pleased!! AWESOME!! I don't like buying overpriced ice cream but I will struggle not to pick this one up everytime I see it. I wish I could agree with this review like I have with most others on this site. But since I found this ice cream at my local CVS/pharmacy on sale for 2 for $7 I have been struggling to stop myself from purchasing it. I have had four pints in the last week. Yeah. I need to stop. @Anon#4: I'm not offended, trust me! i'm just not a huge cake batter fan, i'm glad you are enjoying it! @Shannyn: don't just shop around home, shop around work too! never be afraid to try a new grocery store. A decent B&J's flavor. I could take or leave the cake pieces, but the cake batter ice cream base is delicious. Very, very sweet (maybe too much for some), but delicious nonetheless.